The choral parts in her five-minute “Magnificat,” set primarily in octaves convey the effect of great strength and asurance, as this text demands. The independent organ accompaniment is supportive, adding texture and color. This is not one of those commissioned works that have a haunting ‘take the money and run’ feeling about them. No, Zwilich knows the trumpet firsthand and has tremendous respect for both Severinsen’s virtuosity and his artistry. She has produced a work that challenges both soloist and orchestra, and rewards the listener. …an effective curtain raiser that transformed the [Rochester Philharmonic Orchestra] into a joyous chorus of bells. …enthusiastically applauded. …a euphonious 10-minute piece, a surefire audience-pleaser. The brightness and clarity of [the hall’s] new acoustics were established early in Ms. Zwilich’s “Celebration,” which begins with bells and tympani in a variety of timbres and then utilizes other instrumental voices and choirs in a festival mood. It does this with lively humor and musical feeling, without seeming like deliberate sound effects. Zwilich has created a stunning work that is destined to be heard far beyond its premiere performances in Indianapolis. The usually conservative audience greeted Zwilich’s short, splendidly orchestrated work… with prolonged applause. The instrumentation…insures rich and varied sonorities, but the solidity of her musical idea and her grasp of its expressive possibilities makes this piece impressive. …this thoroughly contemporary work shows that there are still rich possibilities in the traditional musical ideals of expressivity, direct communication and thorough craftsmanship. Simple musical elements expressionistically touched on grief, outrage, bewilderment. Zwilich’s widely admired “Chamber Symphony” was the stuff of profound, reflective feeling as well as a solid, musical intellect. …this very beautiful piece is marked by long arching melodies, by slightly old-fashioned roulades for piano, delicate combinations of instrumental colors, and a fascinating deployment of instruments (violin, viola, cello, flute, clarinet, and piano) now in the combined textures of an orchestra, now in the solo textures of a chamber ensemble. It’s a superb piece of music, a model of bold spirit and careful craftsmanship; Zwilich has struck a fine balance between touching lyricism and muscular, jumpy energy. …Zwilich writes masterfully for clarinet, with an unerring grasp of its idiom: The liquid flow of the solo part in and out of the orchestra was as natural as water, and every phrase seemed placed exactly where it ought to be in the instrument’s wide and varied range. [The] movements played off each other very well… jerky, punchy opening… the Elegy opened with the stirngs softly intoning A-G-sharp-A in a manner somewhere between a prayer and an admonition… the third movement came roaring out as a carousing spree… a fourth movement that was contemplative and plaintive… The three-note motto returned in variants, and its use as the work’s final statement was a structural master stroke that left a deep emotional impression. …a fascinating example of sophisticated and audience-friendly contemporary composition which owes to no particular school…one of the nation’s finer living composers… This is a forceful work. Ellen Taaffe Zwilich’s “Clarinet Concerto” would surely have turned out to be quite a different piece had not [September 11] arrived just as she was about to start work on the second movement… Astonishingly,…the entire piece shows no sign of sudden gear-shifting … It’s all done with the most skillful application and development of its musical materials – a score truly instpired by a tragic event and one that is likely to transcend it. The piece is an outstanding addition to the flute repertoire.... Zwilich, a Miami native and Pulitzer Prize winner, has conceived a lyrical and rhapsodic rumination that exploits the solo instrument’s colors and range. ... The score is masterfully conceived, with the beautiful string writing complementing the whirling solo lines. Zwilich explored the instrument’s possible depths and heights with a sharp focus. The new 17-minute concerto has an opening movement that might be called Brahmsian in its majesty and emphasis on the low, dark sonorities. Once the solo instrument enters, Zwilich exploits the broadness of its range and lyrical potential. Echoes of Shostakovich come to mind, but the musical personality that emerges is very much Zwilich’s own. It is in its livelier second movement that this concerto really comes to life, with a marvelous cadenza that shows just about every aspect of the instrument. Zwilich has proven she is unafraid to write in idioms a listener can absorb immediately. She doesn’t just dust off old formulas. Nor does she find easy answers to her musical questions. In her new concerto, Zwilich avoids the temptation to give us the stereotypical view of the bassoon as jocular figure. There are few playful passages in the concerto, which stresses the solo instrument’s ability to unfold lyrical lines and encompass an expressive spectrum with great agility. Zwilich has written a dazzler… Zwilich’s orchestration cushions and shows off the solo part as the silk in a jewel box shows off its precious gem. The concerto will also certainly enjoy a life beyond this occasion; people who love to play the flute and to listen to it are going to want to return again and again to the slow movement of this piece, a long, sustained, achingly beautiful song. The other two movements are are also remarkable both in idea and in development; Zwilich courteously helps the listener enjoy the unfolding process of the music. Every turn reveals a new element in the landscape: a change or character in the strings, a new color effect in the horn. Zwilich has written a fluent, virtuosic and immediately compelling concerto that deserves to enter the repertory. …the one-movement concerto was suffused with the romantic feeling of a Mahler song symphony in modern-dress orchestration and harmony… Zwilich’s music communicated the freshness of contemporary musical poetry. Her ideas were fresh and modern-sounding without throwing out the accumulated musical wisdom of the past… This music is worthy of the attention of anyone seeking a fresh experience in contemporary music. Mrs. Zwilich is an original composer whose career is well worth watching. It is one of a music lover’s most rewarding experiences to hear a new work that has a chance of surviving into the repertory of future generations… the new concerto is continuing proof that it is possible to compose aurally pleasing music without sacrificing a 20th century identity. …the piece is pure Zwilich, and for those who really know her work, this is recommendation enough. This concerto is most likely the finest work of its kind since Samuel Barber’s, and it emphatically deserves a firm place in the current repertory. Zwilich’s “Piano Concerto”…is a substantial piece that should easily find a permanent place in worthy pianists’ repertoires. It has all the earmarks of Zwilich’s previous scores: logical organization, intensity of purpose, simple motives turned into complex but readily accessible overlays of sound and ultimate economy of musical statement. It is eloquently orchestrated and consistently thoughtful, with no apparent vapidity soiling its fetching musical ideas. The Zwilich piano concerto could well be a major addition to the repertory. To her credit, Miss Zwilich is carrying on the business of Bartók, Prokofiev, Shostakovich, Bernstein & Co. Her wonderful, accessible new concerto poses no problems whatsoever to anyone familiar with the work of her illustrious predecessors. …a work that should find rapid assimilation into the repertory… it is exceptionally rewarding and enjoyable music. The work goes from driving brilliance, complete with cadenza, to dark brooding in a lento. It concludes with an unsettled — and unsettling — allegro moderato. It is a work that is at once both colorful and substantial, and likewise should hold a secure place in the standard trumpet repertoire. This is a big piece, in scope if not its modest instrumentation, enormously virtuosic and demanding on its participants. Zwilich… is a composer of substance and imagination who seems to grow with every new work. It was refreshing to hear a modern trumpet concerto and, especially, one containing such distinctive and interesting ideas. …clarity of form; jaunty, ostinato rhythms; atmospheric instrumental writing and a trumpet part that ought to challenge the greatest virtuoso… The result is a three-movement work whose writing is passionate, romantic and witty, and whose gestures derive from the whole history of music, including jazz… lots of fun. The clever scoring for bass clarinet, vibraphone, and contrabass provides a refreshing aural experience within a conservative twentieth-century context. The very sound of [it] quivered with imagination; and the piece’s formal outlines… were alive with feeling. …a marvelous work that communicates immediately to the heart, yet at the same time stimulates the intellect. Highly Romantic… a demonstration of the violin’s lyrical qualities… brilliantly orchestrated. The Zwilich “Concerto” furnished both the soloist and orchestra with the daunting task of making the audience receptive to a completely unfamiliar work. But once the music started, the creative sounds proved mesmerizing. From the opening sustained tones of the clarinet and flute and the ethereal violins, this work cast a spell over the audience. [Stephanie] Chase’s expressive opening solo tones, which rose over shimmering repeated violin tones, led the way to a first movement of strange but compelling beauty. … Despite the audience’s unfamiliarity with this often hauntingly beautiful music, the orchestra and soloist were accorded a very enthusiastic ovation at the conclusion of the concerto. Warmly expressive and communicative music. A magnificent piece of warmly lyrical music that compares most favourably with the concertos by Walton or Prokofiev. Zwilich has contributed a masterwork to the repertoire that explores the instrument’s multiple personalities. The violin’s inherent versatility shines in the soaring cantabile lines of the second movement and throughout the finale’s virtuosic moto perpetuo. …a gift to the violin, so richly does the composer exploit the solo instrument’s essential character. …a wonderfully engaging work. Zwilich was herself a violinist and knows the instrument heart and soul; she also knows how to write music of great aural appeal that is solidly and astutely crafted… Woodwinds glisten, strings simmer, the sonic atmosphere generally shines… Zwilich’s tour de force is the second movement, taking Bach’s great solo violin Chaconne as its point of departure and transforming Bach’s opening notes into a motif that grows almost menacing – a theme of fate – towards the end. The movement’s emotional tension, building slowly, takes one by surprise and lingers in the mind long afterward. With warmth and lyricism, a love song to the violin. …the concerto in two movements covers a gamut of expressive moods, from dark-toned drama to “joyfulness” in the finale. If the “Double Quartet” is any indication of her talents, she deserves all the laurels that she has received… The triumph was that she succeeded in being conservative in stance without being derivative, intensely personal in expression without being flaccid in structure, intellectually uncompromising without alienating her audience. To discover all of these features in a single work is rare indeed. This was a composer intent on communing with her audience and in full command of the technical means to do so… throughout her piece Ms. Zwilich displayed clear-eyed maturity and a rare sense of balance. She writes music that pleases the ear and yet has spine. …the work is impressive in its idiomatic writing for the violin. “Episodes” unfolds without pitfalls or pretension. The Arioso is a soulful, eight-note melody that tests both deep and shallow tonal waters, but stays surprisingly simple… the Vivace, a frenetic dance full of searing high notes, glissandos, double-stops and pizzicato embellishments. Perlman’s giving the first performance was a coup because, for all his eminence, the violinist hasn’t played a lot of premieres… It was a tremendously exciting performance of a satisfying piece… then [Perlman] did an excellent thing. He and [pianist] de Silva played “Episodes”…one more time. They gave it stronger dynamic force and brought out the drama of the first movement. Zwilich’s “Episodes” is working its way into the standard chamber repertory – and deservedly so… “Episodes” creates a personal and compelling musical world. …an accessible work played with heart, consists of an intense arioso and a fiery vivace. “Fanfare” featured three horn sextets tucked away in the balconies that punctuated the symphony’s playing onstage with dramatic blasts of music. …crafted with skill and care… a very effective addition to an orchestral program. It’s a piece I would like to hear again … more serious and more erudite [than many contemporary works] but never remote or insular. …flavorful dashes of dreamy lyricism and explosive violence. …a fresh experience… a charged, tautly dramatic and beautifully crafted set of musical representations based on a series of paintings… Few composers so successfully combine consonance and dissonance. …a sort of late 20th century “Pictures at an Exhibition,” there are moments, especially in her idiomatic writing for the keyboard, where she sounds almost like a latter-day, and more biting, Rachmaninoff. Many American composers have written fanfare-dominated occasional pieces but few with the mastery of Zwilich. This score revels in the instrumental colors of every section of the orchestra. The strings offer a spacious, thrusting theme that contrasts with the bright glints of woodwinds and trumpet fanfares in concert with gleaming mallet percussion. Zwilich creates a varied and exciting sound world. Zwilich interleaves the folk theme in the dialog between piano and orchestra like a recurring memory intrudes at various points when, say, one is drifting off to sleep. It testifies to her fertile inventiveness and total mastery of the compositional mode that the folk melody fits right in with other modern sounding motifs. …a magical performance that stays with the listener long after the recording is over. The work… is typical of Zwilich: rich in harmonic imagination, detailed in orchestral coloration, alive with the sense that the composer has something to say and wants you to hear it. …the certified jewel of this concert… Zwilich’s two-movement score is an odyssey of sound that explores urban, mystical, modern and romantic themes in an expansive sweep through expressive idioms… fresh and sharp, spooky and tender, bold and immense. …a vibrant dialogue between piano and orchestra… a substantial addition to the repertoire that coukd endure to the next century. “Millennium Fantasy” is a fine addition to the piano concertante canon. The accessible, tightly crafted work is characteristic of Zwilich in its graceful melding of solo virtuosity and colorful orchestral effects. … a wonderful five-movement suite… In dedicating this piece to pedagogue and violinist Louise Behrend, Zwilich seems to have been intent to compose something that is playable and open, like an updated Bach partita… What could better honor Behrend’s career than such a work? [The musicians] capture every mood and nuance in these masterful works by one of America’s leading compositional lights. Recommended, then, on every level, as an essential acquisition for your collection of contemporary chamber music. Zwilich’s disc, Passionate Diversions, is like a musical sprint: tremendous amounts of emotional and physical energy are expended in a very short period of time. One of the most successful things about Passionate Diversions is the full spectrum of emotions and colors that Zwilich leads the listener through. Her music combines the sophistication of a modern composer with an approachability that pleases her listeners. ... The Quintet for Violin, Viola, Cello, Contrabass and Piano (2010) ... is an extraordinary well integrated work, highlighted by the middle movement “The Moody Trout” which transforms a small quote from Schubert’s work into an evocative bluesy fantasy—and a vivacious finale that’s lots of fun. ... The Septet for Piano Trio and String Quartet (2008) develops tension from the very get-go by creating dialogue between the Miami String Quartet and the Kalichstein-Laredo-Robinson Trio. It has an orchestral sound that is both exciting, and dreamily Romantic. ... Their superb performance reflects the fun they must have had in making this CD. All three of the works on this disc are enjoyable yet sophisticated chamber works that represent the music of one of America’s finest composers. …a charming group of musical sketches inspired by the well-known Charles Schulz characters. With the blessing of Charles Schultz, who is such a fan he has mentioned her twice in his comic strips, she has written “Peanuts® Gallery,” a lively, six-part character study for piano and orchestra. (Linus’s signature music, for instance, is a gorgeous lullaby; Lucy gets a tantrum in the strings.) After last month’s world premiere at Carnegie Hall, the 5-year olds cheered, and so did the adults. “Peanuts® Gallery” may be intended for children, but it’s rhythmically diverse and emotionally engaging. Miss Zwilich’s exquisitely shaped piece was rich in contrast and wonderfully lyrical in the way it balanced and blended the string choirs. It is very accessible at first hearing, which is rather rare for contemporary music. It contains an eloquent simplicity that is attractive and pleasing, and a lyrical section that is simply gorgeous and comes as a surprise in the middle of the piece. The Prologue has a haunting quality to it, which returns with a vengeance at the end of the piece and won’t go away… The work got a big hand, and rightly so. “Prologue and Variations” is a taut and succinct work tackling many deep emotions that all come across with confident expressive authority. The handsome two-movement piece did something rare among contemporary works. It left one wanting more. It’s obvious why musicians are drawn to Zwilich’s scores – they are modern and abstract yet cogent and expressive. And from a performance perspective, the music is both challenging and flattering. The new quartet is full of ideas that exploit the interplay of instruments in their varied ranges. …melancholy … beautiful and touching. The Kalichstein-Laredo-Robinson Trio, celebrating its 35th anniversary, performed Zwilich’s new Quintet with violist Michael Tree and bassist Harold Robinson before a packed house in the First Unitarian Church, Avondale. The new Quintet proved to be a crowd-pleaser that had the audience on its feet at the conclusion. But it also seems destined to find a home among the established chamber music repertoire. Ms. Zwilich made a point of citing Schubert’s “Trout” Quintet, which has the same instrumentation, and calling her central movement “Die Launische Forelle” (“The Moody Trout”). But Schubert appears only obliquely; more strikingly, the work is suffused with blues harmonies. You hear it in bent notes in the violin and viola lines, in brisk running passages on the piano, and most of all in a recurring syncopated three-note figure — an ascending and descending minor third — that calls to mind a similar motif in the hard-rocking finale of Prokofiev’s Piano Sonata No. 7. And though Ms. Zwilich changes meters often in all three movements, the piece has a pulse that makes it hard to resist. New companion pieces to long-established masterworks are arriving with increasing frequency, often with an inhibiting effect on the most strong-minded composer. But not Ellen Taaffe Zwilich. The 72-year-old author of numerous rock-solid concertos and chamber works was commissioned, partly by the Philadelphia Chamber Music Society, to write for the instrumentation of Schubert's Trout Quintet, and if anything, found an even more defined voice. At the Oct. 19 local premiere at the Kimmel Center by the Kalichstein-Laredo-Robinson Trio (augmented by violist Michael Tree and bassist Harold Robinson) Zwilich's fine Quintet came off as if the melodious Schubert piece didn't exist. Only Zwilich, who wrote her piece for the same instrumentation as Schubert’s Quintet, could somehow find the Gershwin in Schubert. In the second movement of her Quintet, which received its world premiere Sunday at SummerFest, Zwilich took a snippet of Schubert’s melody, augmented it until it was nearly unrecognizable, and transformed it into an all-out jazz-inflected romp. ... No wonder the Quintet was a crowd pleaser, earning a standing ovation from the audience in Sherwood Auditorium. Jazzy, bluesy, and full of American optimism…it is, of all things, an homage to Schubert’s Trout Quintet. …what a feat of loving reimagination this was, finding the Gershwin in Schubert. This time [Zwilich] struck gold. It’s not often that a new work of music gets such an immediate, warm buy-in, but a quintet that had its Florida premiere Tuesday night didn’t do a lot of things you might expect. …The “Quintet for Contrabass, Cello, Violin, Viola and Piano” by Ellen Taaffe Zwilich, written in 2010 on commission from the Kravis Center and 10 other groups and individuals, is a muscular, bluesy work that takes the performing forces of Schubert’s Trout Quintet and gives them smoky-club music to play. …The quintet is a three-movement work of vigor and wit that has taken some of the technical elements of jazz and blues — the minor third, the blues scale — and treated them in a Beethovenian way. The musicians performed with knife-edged ensemble precision in this work that was written for them, giving it the extra jolt of energy that comes from a well-rehearsed, confident performance. But the showpiece of the evening was Zwilich’s “Quintet” … She wrote it for the same instruments as Schubert’s “Trout” Quintet…but the piece turned out to be a different kettle of fish entirely. Where Schubert’s trout plays happily in calm and limpid waters…Zwilich’s is named “Die Launische Forelle” – “The Moody Trout” – and churns and thrashes its way darkly upstream. The new “Quintet” proved to be a crowd-pleaser that had the audience on its feet at the conclusion. But it also seems destined to find a home among the established chamber music repertoire… Zwilich’s new “Quintet” is inventive, witty and well-constructed, and it gave ample opportunity for each musician to shine. …It was a fun piece, partly because the performers communicated how much fun they were having. …an extraordinary well integrated work, highlighted by the middle movement “The Moody Trout” which transforms a small quote from Schubert’s work into an evocative bluesy fantasy–and a vivacious finale that’s lots of fun. …rippling lines and sparkling colors. …vigorously entertaining… Zwilich’s language here is complex yet approachable, attractive for its transparent textuers and fundamentally tonal. …successful… The imagination and mental acuity expended in fashioning a coherent composition that employed all those instrument groups was astonishing. …The memorable aspects of Zwilich’s four movements were the unique sound worlds she created, melding the exotic voices of world percussion with the familiar tones of a European-style symphony orchestra, and the vision of five drummers doing what they do best, counting and playing. The work cleverly manages to effectively blend a diverse battery of percussion instruments with orchestra…both [The “Violin Concerto” and “Rituals”] demonstrate Zwilich’s unmitigated mastery of the concerto medium. …her music is supremely listenable, accessible, and perhaps not coincidentally, beautiful. Zwillich emphasized the pitch capabilities of a family of instruments not usually treated as melodic and created a piece where every resulting pitch is carefully worked out. The result is one of the most melodious and harmonious of percussion concertos and one of Zwillich’s most exciting compositions to date… Wherever you are, demand that your local orchestra programs this blockbuster piece! …the piece makes full use of the percussion quintet’s exotic timbres and ritualistic associations… [Zwillich is] one of today’s most versatile composers at the peak of her game. …absolutely worth a second listen… The percussive palette is extraordinary; “Rituals” creates a parade of exotic imagery inspired by the Japanese finger bells and temple bowls, gongs from Thailand, drums from Africa and much more. The language is post-romantic, thematic materials are memorable and dramatic (even cinematic), and her handling of the instruments is extremely colorful. ... The musicians obviously love this music and they made their listeners love it, too. There must have been something liberating for Ellen Taaffe Zwilich (left) to compose her Septet for piano trio and string quartet -- she says as much in a program note -- because it felt like a modern masterpiece in Thursday's performance at the Capitol Theatre. There are no other known septets for this combination of instruments, and that seemed to energize the two ensembles for which it was written, the Kalichstein-Laredo-Robinson Trio and the Miami String Quartet, who were giving their 10th or 11th performance of the work since its premiere about a year ago. At this point, these superb musicians are so far inside the music that they gave a spectacular, immaculate performance. Who says chamber music has no passion? Ellen Taaffe Zwilich's new Septet is a bear hug of a piece, wrapping a muscular piano trio around a strutting string quartet. As the bold phrases flow back and forth, the two ensembles dance in a powerful, exhilarating match of wills. Zwilich's Septet is a powerful, moving work, surely destined to become a part of the canon. A compelling and eclectic work that should easily pass into the standard repertoire of chamber music. As played with robust and nuanced charisma by the Kalichstein-Laredo-Robinson Trio and Miami String Quartet, the score emerged as a finely wrought, organic and rich tapestry of ideas. ... In the finale, Zwilich sums up the work’s many themes with such skill that the seemingly novel instrumentation is revealed to be a sonic means to a deeply musical end. ...a magnificent Septet written for the Kalichstein-Laredo-Robinson Trio and Miami Quartet. ... Here was what seemed like a full orchestral sound, as Zwilich opened with a quote from her Trio followed by another from her Quartet No. 2. ... It is an utterly substantial 26-minute work. Zwilich has actual, challenging ideas that she explores with passion, decisiveness and humor in this new piece (which premiered just a week ago in New York). Her four movements are investigations. The first examines ways a trio and a quartet can relate to each other and recombine; the second is a passacaglia-variation set that views the theme through the kaleidoscopic lens of historical styles; the third explores the possibilities jazz offers to an already rich musical vocabulary; and the last is a wrap-up and reconciliation of what has just happened. Together, the septet is a snapshot of a party where people are introduced, have conversations, play and then go their separate ways...[the performance] bristled with passion, intensity and color. Written for the famed Kalichstein-Laredo-Robinson Trio and the Miami String Quartet, the work is possibly the first written for this kind of instrumental grouping, and as such attests to the inventiveness that has made Ms. Zwilich one of America's most respected composers. Last week's world premiere performance, in New York, was deeply satisfying. In her masterly deployment of this novel instrumentation, she manages to integrate the trio and quartet while maintaining their individuality within the overall musical fabric. Moreover the emotive drama of her thematic ideas, the logical clarity with which she develops them, and the architectural polish of each movement make this an important addition to the chamber repertoire, and one that warrants frequent performance. Ms. Zwilich, who celebrates her 70th birthday on Thursday, has added to [her] catalog with a Septet for Piano Trio and String Quartet, which received its world premiere at the 92nd Street Y on Tuesday with the Kalichstein-Laredo-Robinson Trio and the Miami String Quartet. Given the popularity of the piano trio and string quartet in the chamber music literature, it seems logical that more composers might have combined the two in septets. There are instead myriad other combinations using piano, strings and winds. Thus Ms. Zwilich (who was the first woman to be awarded the Pulitzer Prize for music and the first to receive a doctoral degree in composition from the Juilliard School) had no famous historical precedent to study. The seven members of the ensemble alternated as soloist and partner throughout the four distinctive movements. In “Introductions,” it initially sounded as if the trio – the pianist Joseph Kalichstein, the violinist Jaime Laredo and the cellist Sharon Robinson – and quartet might be uneasy collaborators, but they soon united for a fiery orchestral interlude that ended in unison. In “Quasi una Passacaglia” a repeated motif was played in unison between several instruments and then shared among the group, with nods to baroque idioms and more romantic, exuberant ideas. The jazzy “Games” was followed by the more introspective “Au revoir,” whose voluptuous middle section was followed by a quiet finale. [“Septet for Piano Trio and String Quartet”] has an orchestral sound that is both exciting, and dreamily Romantic. …blues-drenched…packed with ear-catching effects. …a composition that lofted Tin Pan Alley into deep space with tart harmonies, glassy tone clusters and keyboard-spanning runs. While the concerto is virtuosic…it’s not flashy; the display is an outgrowth of a positive energy that runs through the whole work. Very skillfully writen and orchestrated. …it’a an attractive work that goes over well. …[it] has a furious, driving energy. …reflects a generous and natural melodic gift, sure craft and positive inspiration. There is a personality here with something distinctive to say. The music says it concisely and with real urgency or necessity. The Zwilich quartet held listeners spellbound (coughless and quiet) for 25 minutes. The first movement is curiously passionate and emotional; the second fascinates with suddenly shifting harmonies; the plaintive third goes straight to the heart and pierces it; the fourth has an ecstatic apotheosis before a coda that stays with you after music’s end… [Zwilich] certainly knows how to weave a spell, tell and interesting story. You hang on her every note. The audience rose in ovation as she raced to the stage amid shouts of ‘Brava! Brava!’ What a stunning and triumphant evening for everybody. …her “String Quartet No. 2″…has visceral impact. The style is post-Bartok, with scintillating surprises at every turn. Zwilich has rarely met an audience she didn’t please or a musician who didn’t dig into her music with gumption and glee. Hardly any other composer in America gets such consistently first-rate premieres, and this was no exception. Zwilich’s new quartet is a winner, quite likely to make it well into the 21st century and beyond. It is full of passion, eloquence, individuality, strong rhythmic drive, gentleness, and yes, melody in the traditional tonal sense. Zwilich writes in full knowledge of what has happened in music’s history, and has assimilated it as a means of expressing her own individual personality. …a splendid composition of its kind: somber, concentrated and eloquent. The Lydian Trio may have been the first group to play Ms. Zwilich’s lovely combination of angular melodies with simple harmonic magic. One may be confident they won’t be the last. …a true creature of its century… This is a forceful, listenable piece, with rich, transparently orchestrated sonorities. …the sound of the piece, which is gleaming and clear and delightfully full of open spaces. It’s rare to hear a modern work and be able to detect a beginning, middle, and an end, as well as fast sections and slow sections, and other basic ingredients, and still find the piece engaging. Though Zwilich uses an elaborate orchestral lineup, the instrumentation is at all times transparent and never oppressive. On one hearing, “Symbolon” made a positive impression. The tension is immediate and visceral – a driving march that soon opens out to wide vistas created by a broad theme in the violins. The work as a whole – 15 minutes long – is full of bold and vivid strokes, rising repeatedly to big timpani climaxes and embracing a feeling of spaciousness in between. …a three-movement, fast-slow-fast essay that daringly transforms the cello section into a collective soloist, a throaty protagonist locked in combat with the rest of the orchestra… Hard-driving and explosive, the piece erupts from a single rhythmic idea that propels the music forward relentlessly. Even the melody slow movement cannot dilute the restless surge, which continues undaunted right to the final bar. 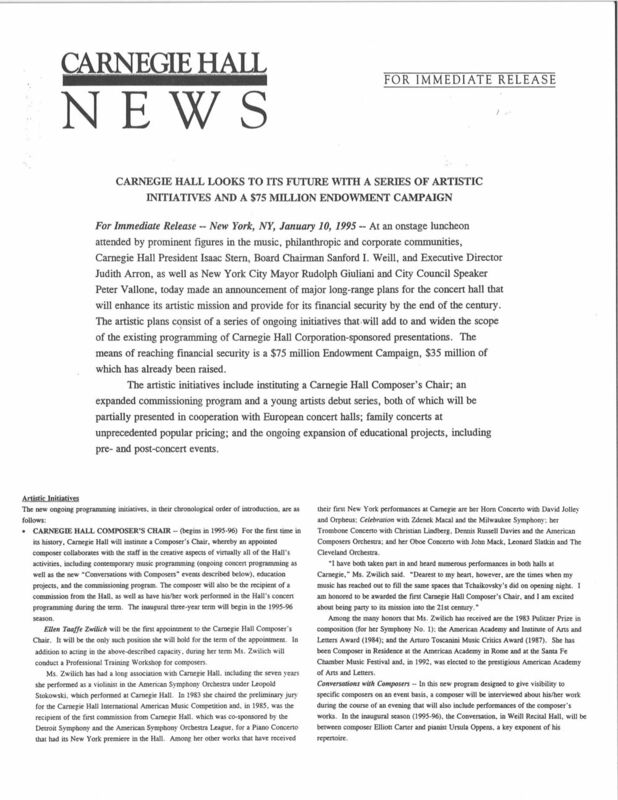 Listeners who tense up when confronted with a world premiere discovered… that they could simply relax and enjoy it, for the symphony remains solidly tonal and more than sufficiently melodic for even the edgiest auditor to have a sort of handrail to hang on to. Zwilich displays an intuitive understanding of instruments and can convey intense emotional content. “Symphony No. 3” resembles a building of glass and steel. The structure has clarity and sheen. It’s clear, even transparent in the details but also strong and imposing. …another work that will surely travel well… the tine, textures, and instrumental gestures always sound fresh and personal. Clearly, we’re dealing with a success story… The new symphony rides well. It’s the work of a pro. Like other recent Zwilich, too, it speaks – or clamors – of success in energy of its form and the boldness of its close. [Zwilich] has written a striking, sumptuous and somber work that reaffirms her high standing among American composers… This is an immediately affecting work that may find wide popularity – succinct, mostly tonal, and ‘romantic’ in its directness of expression. One is aware, time and again, of Zwilich’s great predecessors – Wagner, Vaughan Williams, Shostakovich and, especially, the Alan Berg of the “Lyric Suite” and “Lulu.” Yet, if the syntax sometimes sounds familiar, the symphony itself does not. Zwilich uses existing musical language to say something that is distinctly hers. The music makes the audience sit up and listen … the final moments [of the last movement] built and layered harmonies one on top of the other … each new chord more amazing than the last. …a tonal work with striking percussion parts, delicate orchestration, and above all a remarkable melding of orchestra, chorus, children’s choir and handbells into a cohesive entity… One would think that the symphony would be flamboyant and flashy with an excess of 400 musicians on stage, but instead, the music is meditative, thoughtful, beautiful and moving. 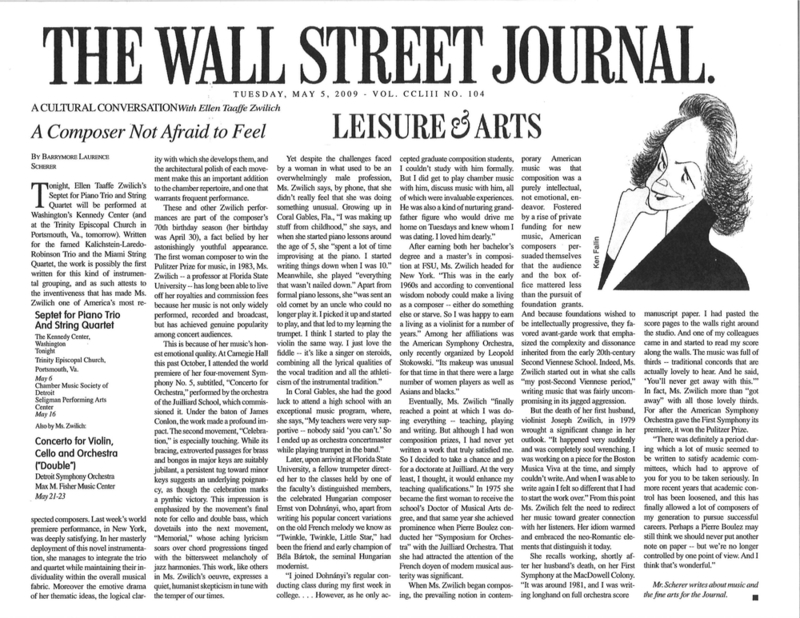 Under the baton of James Conlon, the work made a profound impact. The second movement, "Celebration," is especially touching. While its bracing, extroverted passages for brass and bongos in major keys are suitably jubilant, a persistent tug toward minor keys suggests an underlying poignancy, as though the celebration marks a pyrrhic victory. This impression is emphasized by the movement's final note for cello and double bass, which dovetails into the next movement, "Memorial," whose aching lyricism soars over chord progressions tinged with the bittersweet melancholy of jazz harmonies. This work, like others in Ms. Zwilich's oeuvre, expresses a quiet, humanist skepticism in tune with the temper of our times. [Zwilich’s] mature style — a mix of neo-Classical craftsmanship, roiling energy and tonal accessibility — [was] present in the new symphony, a 24-minute work in four movements. Subtitled Concerto for Orchestra, the symphony demonstrated Ms. Zwilich’s flair for orchestration. Focus restlessly shifted among sections, and from massed groups to isolated soloists. Unorthodox percussion instruments (like the spiral cymbal, a dangling, serpentine coil that offers a distant roar) and techniques (timpani played with a model of wire brush known as dreadlocks) showed that Ms. Zwilich keeps up with recent trends. A brooding fanfare and crackling martial tattoos in “Prologue” echoed and subtly evolved throughout the work. “Celebration,” which could stand alone as a rousing curtain-raiser, bubbled and bristled with youthful ebullience. “Memorial,” inspired by Mr. Conlon’s championing of composers silenced by politics and war, paid tribute with surprisingly languorous, bluesy figures, redolent of music by Copland and Bernstein. In “Epilogue” elements from the preceding movements resurfaced in a stormy finale. As Zwilich tells us in a program note, the new symphony follows a path familiar from most of her large-scale compositions in which the entire work – the thematic, harmonic, structural and developmental character – is generated from a few motives heard right at the beginning. By now she handles this technique with uncommon skill, and not a seam shows. Most of the piece's musical interest is contained in the inner movements: a vigorous celebratory scherzo, possibly designed to show off the instrumental skills of the young Juilliard students to whom the piece is dedicated, and a lyrical "in memoriam" elegy in which Zwilich can indulge her penchant for creating long-breathed unison string phrases that float over jabbing, slightly ominous commentary from winds and brasses. …if “Tanzspiel” turns out to be the only new work of quality in this festival, the season would have been worth it. The new pieces have made a positive impression, especially the dramatic new Zwilich score. …a musical statement worth pondering and hearing again – a substantial four-movement symphonic work of dramatic power and brooding melodic eloquence that any of our symphony orchestras should be eager to play. Set to a commissioned score by Pulitzer Prize-winning composer Ellen Taaffe Zwilich that is hard-charging yet full of foreboding, “Tanzspiel” (literally ‘dance play’) would seem to be a ballet for our times. [Zwilich’s “Trio”] never flags in interest, never divorces itself from the contemporary-music language, yet never wallows in pure academic fussiness, and never shies away from statements of tonality or from snippets of recognizable melody. In short, it is an immensely satisfying, unabashedly modern look at the centuries-old piano trio… It’s the sort of new music that one yearns to hear again. The “Trio” makes a remarkably clear, succinct statement and displays a craftsmanship few living composers have been able to acquire. One of the finest composers of her generation. …the “Piano Trio” impressed as a work deserving wide exposure… one listened to the “Piano Trio’s” unfolding with a sense of eager expectation owing to music that is brilliant in conception, crystalline in organization, dramatic yet accessible in expression. The piano trio of American composer Ellen Taaffe Zwilich breathed with expressive variety, rhythmic grace with ascending and descending sequences. It was a great pleasure to hear. …a work of mighty effects — energetic and athletic, with lightning fast changes in registers and dynamic levels, portentous ostinatos and masses of dissonant, chromatic chords … It’s a ‘listener-friendly’ modernism. 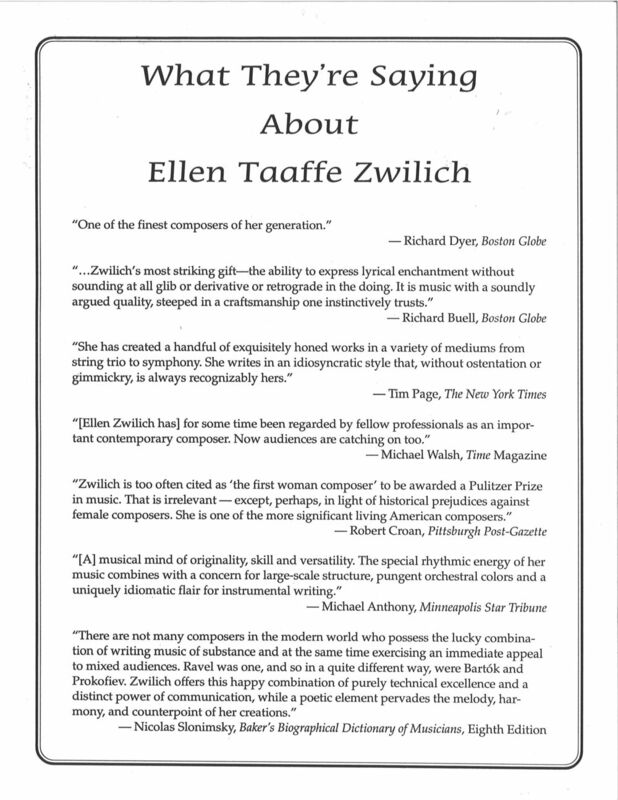 There is more than a passing trace of Beethoven’s intensity and thematic cohesiveness in the 1987 “Trio” by Ellen Taaffe Zwilich… The end result is a gripping aural experience and a major addition to the treasury of chamber music. Appeals to the mind as well as the heart… I found it a thoroughly pleasing and intriguing work. Modern in its structure and musical idiom … a passionate and muscular work with a somber but emotionally intense middle movement and a rapidly potent finale. Hardly derivative post-modernism, it’s a natural reflection of an age in which old and new, pop and classical collide constantly. Indeed, Zwilich’s “Triple Concerto” is considerably more intriguing than Beethoven’s, particularly for the way it distributes material among the three instruments. In every significant respect, the music is a rich, often complex collaboration. …well-built, bright and elegant – a quality piece of work. …handsome and effective… There is considerable melodic appeal in the work as a whole, which maintains an assertive, up-front quality; if there is such a thing as an “American” musical spirit, Zwilich seems to embody it. …a cleverly crafted curtain raiser for large orchestra that fulfilled its purpose handily. In a nod to their string-quartet ancestors, the St. Lawrence played Voyage (2012) by Ellen Taaffe Zwilich, a wondrously concentrated piece commissioned for the centennials of the founding members of the Galimir String Quartet, formed by Felix Galimir in 1927 on the centennial of Beethoven's death. Without any literal quotes that I could detect, Zwilich managed to invoke aspects of the Galimirs' personal and professional journeys, pulling in French and Jewish associations. The piece highlighted an intense sweetness that was, for all but especially for [violinist Scott] St. John, a most appealing trait. ... the piece proved an instant success. Like Zwilich’s other works, the 11-minute piece is easily approachable by an audience - the South Mountain audience burst into a noisy ovation – yet tough fiber lies below the surface. Perhaps it was only by association, but the writing seemed to recall the Vienna of the Galimirs’ time. It opened with the echo of a waltz and went on to evoke the Second Viennese School – especially Berg – in its melodic contours, irregular meters, slightly acid harmonies and bold use of pizzicato. ... Indeed, much of the overall appeal is the invocation of tradition amid fresh areas of expression. …explores more ways in which the various instruments of a string quartet can be combined … Zwilich’s music takes the listener on a sonic journey, with many ports of harmonic and textural call along the way.